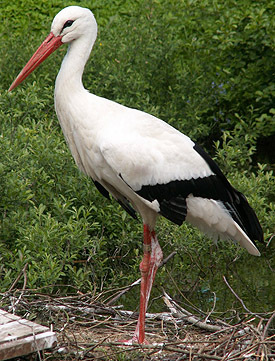 The White Stork Project focuses on using the very common and abundant White Stork as a potential bio-indicator of environmental changes in Armenia. By studying migration patterns and reproductive ecology of White Storks, it will be possible to determine potential impacts of climate change and increased pesticide/herbicide use in Armenia. The project is unique in that it uses villagers as citizen scientists or 'Nest Neighbors' in the data collection process. Their involvement with the research gives them a better understanding of wildlife ecology and improves the relationship between people and nesting storks. Prior to migration, Acopian Center scientists distribute calendar-questionnaires in the villages and show the villagers how to record information on stork arrival, departure and number of fledglings. After the storks have migrated, Acopian Center scientists collect the calendars and enter the information into a GIS database. 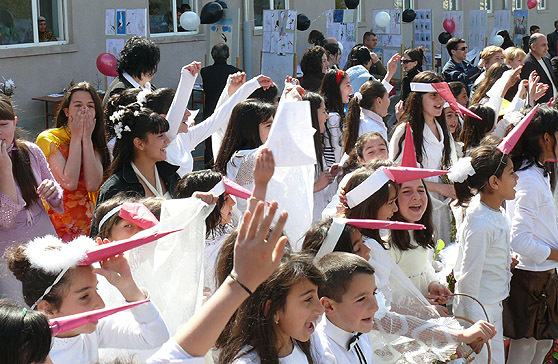 Help support this important project in Armenia by adopting your own stork nest. and becoming a White Stork Guardian. During the spring, our staff also bands the nestlings and takes water and soil samples in stork feeding areas for later analysis. The Acopian Center for the Environment launched a survey on pesticide use in the Ararat Valley after the first results from soil and water sampling indicated the presence of pesticide contamination. Substantial information on almost 1000 confirmed nest sites in Armenia has been collected through 2009. During the fall, Acopian Center researchers conduct award ceremonies to honor 'Nest Neighbors'. At these celebrations, certificates and gifts are awarded, accompanied by songs and plays about storks performed by school children and speeches delivered by village representatives. Dr. Aghababyan launched 'Nest Neighbors'; working with farmers and villagers, to increase public understanding of storks and their habitat. By becoming involved in wetland conservation, Armenians are starting to take notice of what is being decided for natural resource use at local, national and international levels. Now, over 500 families are involved in 'Nest Neighbors' and regularly monitor the stork population. Since 1994 the Whitley Awards have been awarded annually. They are one of the largest nature conservation awards available, recognizing outstanding efforts by leading local conservationists whose work is based on sound science and which fully involves local communities. Dr. Karen Aghababyan's research on the white stork is focused in the Ararat Valley, home to agriculture for thousands of years. During the Soviet years the wetland areas were reduced by Government draining and although they are slowly recovering a new threat has emerged - Armenia has been granted $200 million for infrastructure development, including draining the Ararat wetlands at the base of Mount Ararat, for conversion to agriculture. For centuries the White Stork has been regarded with great affection in Europe. Although they were once prolific, the intensification of agriculture and draining of wetlands has resulted in a decline in the populations. Traditionally storks like to keep their feet wet feeding in wetlands ditches or ponds where they catch frogs, lizards and small rodents. Although many Armenians feel indifferently towards wetlands, White Storks are seen as a cultural icon. They are seldom persecuted and when storks nest close to people, on anything from telegraph poles to roofs, it is a sign of good luck. Dr. Aghababyan has made birds popular in Armenia, teaching bird identification courses in English, Russian and Armenian. Using the White Stork as a flagship species, Dr. Aghababyan launched 'Nest Neighbors'; working with farmers and villagers, to increase public understanding of storks and their habitat. By becoming involved in wetland conservation, Armenians are starting to take notice of what is being decided for natural resource use at local, national and international levels. Now, over 500 families are involved in 'Nest Neighbors' and regularly monitor the stork population. 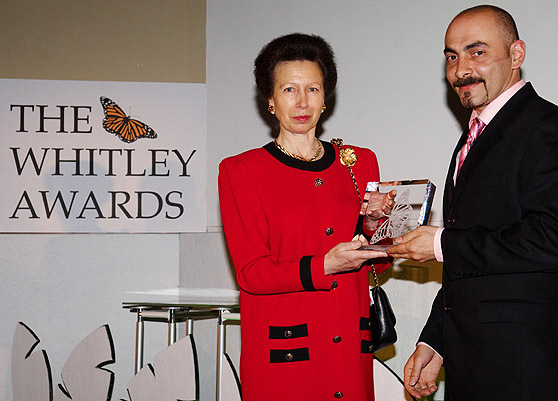 HRH The Princess Royal and Sir David Attenborough (not pictured) presented the Whitley Award to Dr. Karen Aghababyan in 2007 at London's Royal Geographical Society. It was the first time anyone from Armenia has won the Award.